The ten minutes you missed. Until now. “You do advance your cunning more and more. Lost in all of the hoopla surrounding Pope Francis’s 80-minute-long interview with reporters, given while on the plane traveling to Rome from Rio de Janeiro, is the short, secret interview that the pontiff gave to three reporters afterwards. For the sake of secrecy and delicacy and all that other important stuff, I’ll simply refer to them as “A”, “B”, and “C”. How do I know of this secret, short interview? My short answer: that’s my secret. The longer answer involves drones, leakers, bugs, and a bit of imagination. Actually, more imagination than anything else as my budget doesn’t really allow for drones and I find leakers to be a bit awkward and jumpy. Pope: Oh, hey, A, B, and C. What are you doing at the papal bar? A: Uh, well, we were, um, looking for some liquid refreshment, if you know what I mean. Pope: (Smiles) Holy water, perhaps? C: I actually prefer Bud Lite, but don’t tell my friends. They think I’m a pinot gris guy. A: Can I ask a question? Pope: (Grins) I don’t know. Can you? Or do you mean, “May I ask you a question?” (Laughs gently) Ah, I’m just giving you a bad time. A: (Scratches head) Um. Can popes do that? B: (Mutters) I think so. Benedict used to make fun of my Latin all of the time. And I attended thirteen years of private Catholic schools. 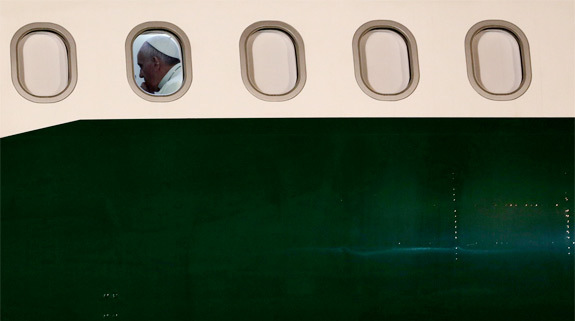 Pope: Sure, sure; ask a question. A: Why does the Catholic Church hate gay people? C: Yeah, great question. I’ve wondered the same thing for years. Benedict said the Church doesn’t hate gays, but I never felt like he was sincere. I’m pretty sensitive to sincerity. Pope: Well, of course the Church doesn’t hate gay people. I just spoke about that a few minutes ago. B: So you do hate gays? Like, a lot? Or about that same amount as you hate women? C: Good question! Now that’s some tough journalism! A: Even Muslims? Because Benedict hated Muslims. He gave that speech in Reagansville or whatever it was called, and said the guy who started Islam was a serial killer and an Arabian pimp. B: Yeah, I thought the pimp remark was pretty low, especially for a guy who clearly hates Jews, puppies, and walks on the beach. But you, Frank, seemed fine with the beach. Weren’t you concerned that a party could break out at any moment? I’ve heard that real Catholics don’t believe in having fun. Pope: (shakes his head slowly) Gentlemen, gentlemen; I’m very surprised and saddened by these strange questions and offensive remarks. I know you heard my lengthy remarks earlier. C: Yeah. But I usually tune out after a few minutes. Besides, all of this “God stuff” can be a bit heavy. Shouldn’t the Church be more concerned with being relevant? I mean, how are you going to attract young people with all of this religious talk? Pope: Uh, you did see the three million pilgrims, most of them very young, at the closing Mass, right? A: (Laughs) Sure we did. But don’t you think most of those people just wanted to be on television? That’s why I was there. Pope: No, I think they really wanted to worship God together and give a public witness to their faith. B: But do you think they would have come if they knew you were going to infallibly pronounce that Catholics should be gay and women should be priests? Pope: Good grief! What are you talking about? C: I think “B” is just trying to get a straight answer, if you pardon the joke (laughs). B: Say, I have a question: why do you fly on airplanes when the Catholic Church says science and technology are tools of Satan? A: And why are you against the Vatican having a lobby decorated by gays? At this point, Pope Francis politely excused himself. A: That was rude. He didn’t even seem interested in answering the tough questions. And Catholics wonder why the Church is almost dead. C: Exactly. He’s just like Benedict. Ask him a simple, direct question and he starts talking about “Herman Knuticks” or some such guy. I never could figure it out. Say, is that a Coors Lite? B: No, I think it’s a candle. 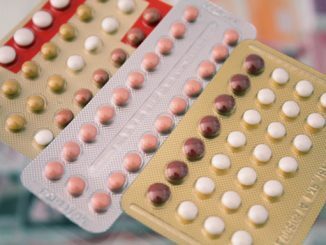 What Do Ricki Lake, Georgetown University and The Pill Have in Common?